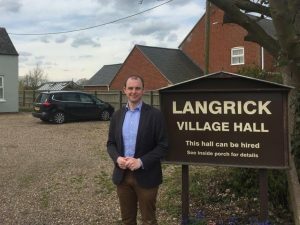 Matt Warman MP is inviting local residents to Boston and Skegness’s first ever Older People’s Fair. The information fair will be held at The Storehouse on North Parade, Skegness on Friday 8th June 2018 from 10:00 until 13:00. Exhibitors at the fair will include charities, agencies and local organisations that provide support and assistance for older people. Everyone has a parent or grandparent, colleague or friend who they look to for advice and to learn from – this event is about bringing older people and the organisations that can help them together to create better understanding and support. Age UK Lindsey, Barclays Digital Eagles, Lincolnshire CVS, U3A, Skegness and District Running Club, St Barnabas Hospice and Healthwatch Lincolnshire. Along with the main exhibition, there will be a private room available for confidential conversations with exhibiting organisations. Additionally there will be a number of presentations throughout the day with topics including Scam Awareness and Wealth Management. Entry to the event is free of charge, and includes refreshments. For more information, please contact Matt’s office on matt.warman.mp@parliament.uk or 01205 809110.